cleaning, and a comprehensive exam today! Located near Mansfield Dam, and with views of Lake Austin and Lake Travis, the office with the iconic blue roof has been the home for quality-minded patients from the Lakeway, Steiner Ranch, and all other areas of Austin for nearly 20 years. We are committed to providing quality health care to families located in the Austin area and treat patients of all ages. We provide comprehensive and holistic solutions for our patients oral health needs. Believing in the importance of listening to our patients, we take the time to truly understand each person’s needs, goals, and lifestyle. By understanding our patient’s objectives we can provide solutions that will improve their health while transforming their smile into something bright and beautiful.Turn to Scott T. Gordon D.D.S. in Austin, Texas, for any and all of your family and cosmetic dentistry needs. Our goal is to provide you with beautiful teeth, giving you even more of a reason to flash your vibrant smile. Members of the American Dental Association™ & the Texas Dental Association™ since 1998 Members of the Omicron Kappa Alpha Dental Honor Society™ since 1997 Austin Lakes Dentistry: Scott T Gordon DDS is located at 3905 Ranch Road 620 N, Austin, TX. We are currently accepting new patients, and you can schedule an appointment by calling 512-377-9799. Austin Lakes Dentistry: Scott T Gordon DDS provides a wide variety of dental services and procedures to address all of our patients' dental health needs. By combining quality patient care with up-to-date technology, we are able to treat patients of all ages in a comfortable and relaxing setting. Our website has information about the following topics: Dentist, Cosmetic Dentist, Family Dentist, Emergency Dentist, General Dentist, Dental Implants, Teeth Whitening, Dental Veneers, Cerec Dentist, Dental Crowns, Dental Bridges, Same Day Dentist, Same Days Crowns, Implant Restoration, and Root Canals. Our Dentist and staff are trained to not only treat patients but to identify what caused the health concern in the first place. This comprehensive approach sets patients of Austin Lakes Dentistry: Scott T Gordon DDS on the road to recovery and long term oral health. Our Dentist and staff are trained to not only treat patients but to identify what caused the health concern in the first place. This holistic approach sets patients of Austin Lakes Dentistry: Scott T Gordon DDS on the road to recovery and long term oral health. By combining the best technology and cosmetics with painless techniques and unparalleled training, Dr. Gordon's services are sure to impress. Our CEREC porcelain dental crowns beautifully restore teeth to their original strength. This machine allows the dentist to restore any decayed or broken teeth and place dental veneers in one office visit. 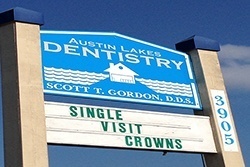 Since a patient will only have to come into our office once for the procedure to be completed, there is no need for temporary crowns or veneers that can fall out or cause discomfort, ensuring an efficient and stress-free time spent at Austin Lakes Dentistry: Scott T Gordon DDS.